I was kind of dragging after lunch time considering my early start to the day. So I decided to go to my classroom and do a little cleaning. I ended up making this 6 x 6 ft. poster with figurative language examples from our current novel. It’s amazing how a little creating can make you feel. I don’t know about you, but I think it’s time for some updated figurative language song lyrics. Katy Perry’s “Firework” has run its course. Just one sample – The song Dee can’t stop singing, and a song that is so appropriate for this winter! 1) Blow up and hang around the room as stations for students to visit. 2) Use one song a day for a bell-ringer activity. 3) Post one song on Schoology each night as a discussion. 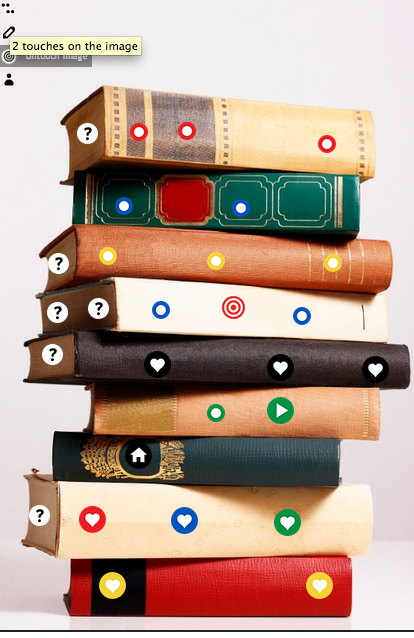 Only after students reply with their findings, they can view other students’ posts. 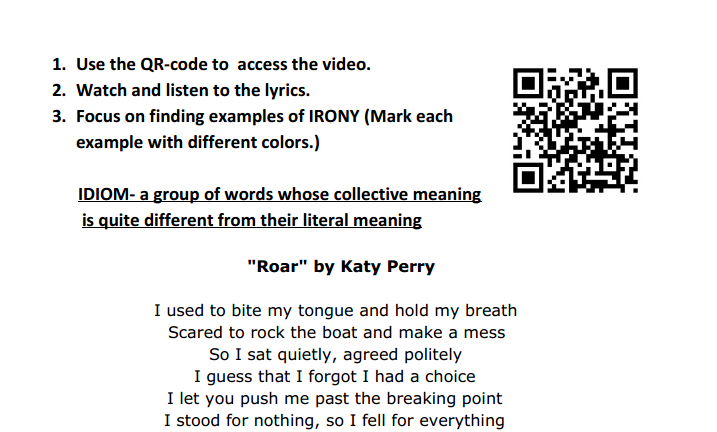 Here is a sample of the QR-code activity. The PDFs are below. If you have any other song suggestions or activities, I’d love to hear them! Share in the comments. I found a few video clips from YouTube that help advertise different types of figurative language and literary terms in class. To read more about my philosophy and approach to using media and visuals, read this post. With SMARTBoards and Edmodo, it is easy to share these videos with students during class or at home. Onomatopoeia is usually pretty easy for students by the middle school level. As part of my effort to reach all learners with visuals and a media tie-in, I love to introduce onomatopoeia with this seemingly unrelated, but ironically related, video. Nothing says personification like talking teapots, dancing silverware, and frisky feather-dusters. This YouTube video covers the following: symbolism, foreshadowing, flashback, atmosphere, and plot twists with Disney clips. There is a short “quiz” at the end. You could also use BYOT to have students create their own videos on these concepts. For example, this video featuring “Hyberbole Man” would work for older students 7th grade and up. It is full of hyperboles and is probably pretty funny to teenagers. Better yet, it might be a nice kick-off for a project where students create their own hyperbole movies. Lastly, this video links figurative language to pop music lyrics. With examples of Katie Perry, Selena Gomez, Green Day, Uncle Kracker, and Taylor Swift…this should be pretty easy for students to relate to. I think students would enjoy listening to music and finding lyrics using figurative language, as well as making their own videos. 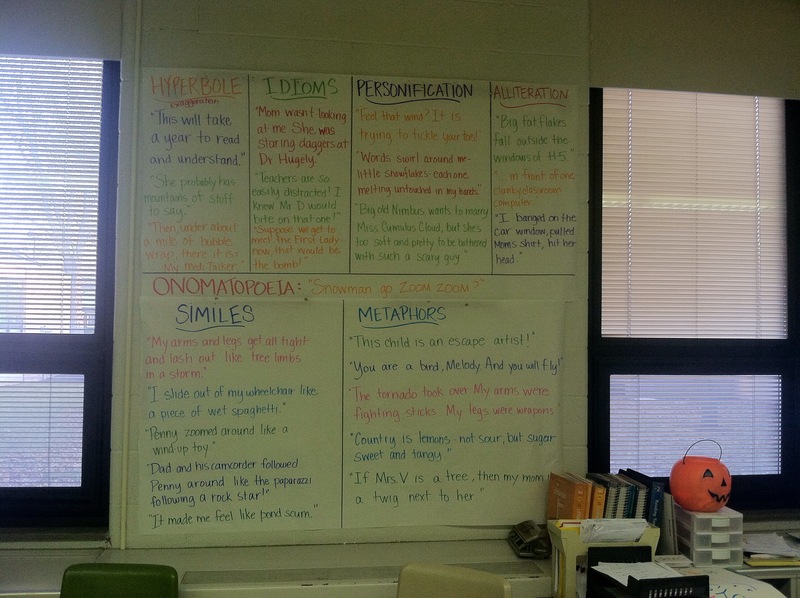 How do you teach figurative language in your classroom? Do you have a favorite app for making videos?